If your business relies on the best technology to complete your jobs then a tabloid copier is the right choice for you. Tabloid copiers give you the power to be able to handle just about any job that comes you way. They give you the ability to accomplish more than ever before in the comfort of your own office. A tabloid copier is a machine that is going to be able to handle tabloid prints. Tabloid prints are twice the size of regular, legal sized paper and measures at 11”x 17”. This is the perfect size print for newspapers, posters, and magazines. The greater selection of media choices lets you be able to do everything from printing legal pages, to making pamphlets, to creating amazing colored posters. Tabloid copiers also let you do more than ever before in even less time. These machines are powerful and made for the busiest offices around. Your colors will pop and your prints will be able to come out lightning fast. 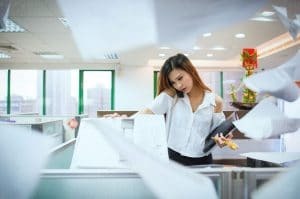 Tabloid copiers come with a bunch of benefits, but they are also more expensive than other smaller counterparts. This is why we advise that only businesses that really need the copiers should get them. Otherwise you could be paying twice as much more no reason.